ROYBA currently leases a parcel of property from Mary Queen of Peace Catholic Church for a $1 per year in the south part of Rogers. Years ago, ROYBA spent $35,000 to build two multi purpose ball fields near the St. Walburga Church in response to a lack of fields in our area. ROYBA is responsible for maintaining the ball fields, the port-a-potty and garbage. Just recently, we are now responsible for mowing and weed control. As the fields get older, the heavy use has taken its toll. In late Spring of 2017, the ROYBA Board approved a rejuvenation project with the goal of improving the baseball experience for everyone who uses this property. A part of the project is also being completed by a future Eagle Scout from Troop 582. And in mid - June , the project was awarded a $5,000 matching grant recognizing the collaboration and value of this project. Improve, and better maintain, existing playing fields to keep up with the demands of practices for ages K-13 years old. 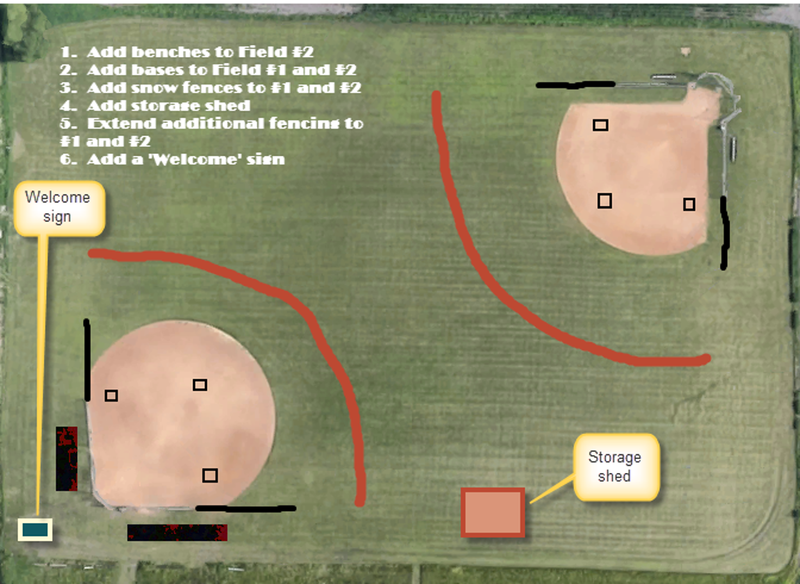 Make field improvements to create a safer and more productive environment for everyone (players, coaches and spectators) that use these fields.